Items dropped off for students will not be delivered to the classrooms, and students will not be called out from class or notified by the school to pick up items that are brought in. Items should be left on the drop-off table on the first floor and labeled with the student’s name. Students may only pick up these items at lunch or after school. The school is not responsible for any items left on the drop-off table. Students are not permitted to order any food to be delivered to the school at any time, whether during school hours or before/after school hours. Any food delivered to the school must be ordered and received by a staff member. Parents or guardians are also not permitted to order food to be delivered to the school for students. If a parent or guardian would like to drop off food for a student, the drop-off procedures must be followed above. As we prepare to move into our new campus, each day we will be providing information regarding the move to the new campus on this blog. Today’s post covers skateboards/bikes/scooters, as well as parent and community member access to the building. No skateboards, bikes, scooters, etc. will be allowed in the new high school building. Students who ride them to school will have a place outside to lock them up, but if they do not have a lock they should go buy one before the first day in the new building. We can’t guarantee the safety of their boards & bikes if they don’t lock them up. We will not allow them to bring their skateboards, bikes, or scooters into the building for safety reasons, even if they don’t have a lock. You can find information about the new building Grand Opening Celebration on Dec 9th here. DVS parents can of course also see the new building at the DVS exhibition night on Wednesday, November 15th starting at 6 pm. For those of you who are new to Da Vinci, Exhibition night is an evening event where students get to show off the work and projects they have done throughout the semester. We love to have every parent attend! Please note that parents are not allowed to follow students into the building on the first day for students Nov 8th, for safety reasons. Stay tuned for more posts as the week progresses! Week 11: our last week at the old DVS campus! Remember, there are 3 PD days allotted to moving in where students have no class – November 3, 6 and 7. Only Da Vinci staff members are permitted at the new campus on these days. During the relocation, we ask students, families and community members not to come to the new campus so that we can get it all set up. Please feel free to email me at swallis@davincischools.org if you have any questions! 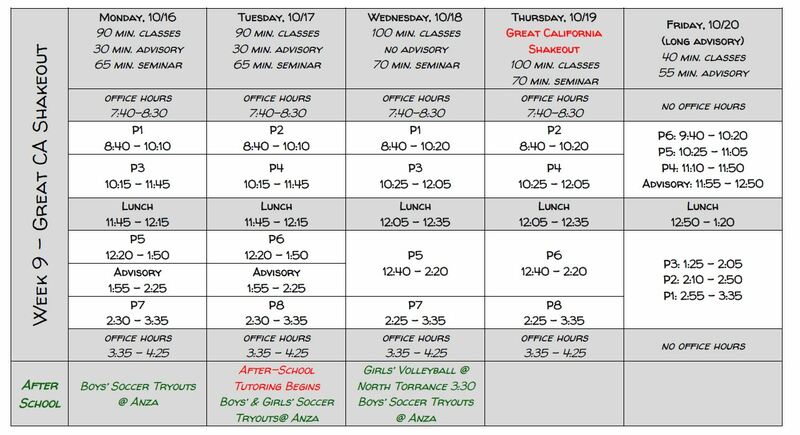 Here is the schedule for the coming week! Science Family, we are thrilled to announce that we will be moving into the new building located at 201 N. Douglas St. in just a few short weeks! There will be more details in the coming weeks for drop-off, pick up, etc. A message with details from our CEO, Dr. Matt Wunder, can be found at the Da Vinci Schools website, or you can access it directly by clicking HERE. It is available in both English and Spanish. We will be adding two professional development days (Nov. 6 and 7) to our schedule. Nov. 3 was previously scheduled as a PD Day (no school for students). The last day of classes at the current campuses for DVC, DVD and DVS will be Nov. 2. Students will begin at the new campus on Wednesday, November 8th. We ask that all students, families and community members please remain off of all campuses (old or new) during the transition unless specifically authorized to be there. Please reach out with any questions or concerns. We are so excited to get into our new home! Our first School Site Council meeting will be Thursday, October 19th! We have moved the meetings to an earlier time this year, from 4:00-5:30pm, to help us increase student and staff participation. Any interested DVS parents are invited to attend! The School Site Council approves long term plans for the school, including the Single Plan For Student Achievement and the Local Control and Accountability Plan. Tentative Meeting Dates for 2017-2018: October 19th, February 8th, April 19th, June 7th, all from 4:00-5:30pm. Families of 11th graders, here is the link to sign-up for your fall family college planning meeting! Please take a moment to ensure that you are signing up with your corresponding counselor. Also, the presentation scheduled for November 7th, given by Ms. Rodriguez, will be conducted in Spanish for all Spanish speaking families. Dear DVS Parents: if you did not have the chance to take the Fall parent survey, we would appreciate it if you would take a few minutes now to fill it out! Your responses will help us to understand how we can improve and better meet the needs of your kids! Week 9: After School Peer Tutoring Begins! 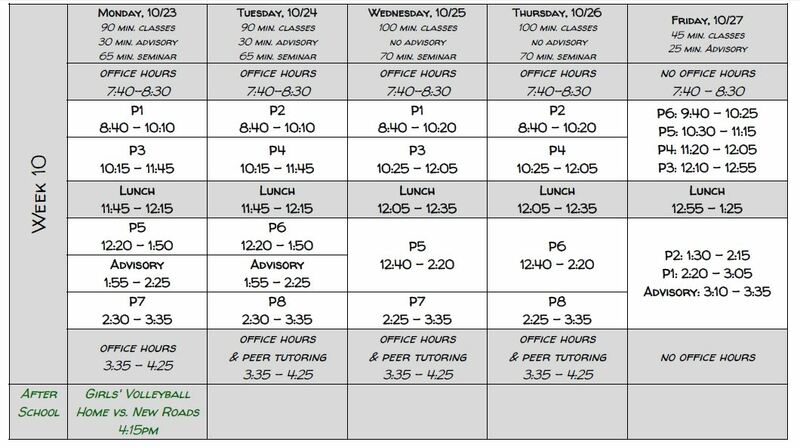 We are back to a normal schedule this week, and after-school peer tutoring by students in our NHS and CSF clubs will be starting in the college center as well! Our first School Site Council meeting of the year will be on Thursday from 4:00-5:30, and we would appreciate your attendance if you can make it!